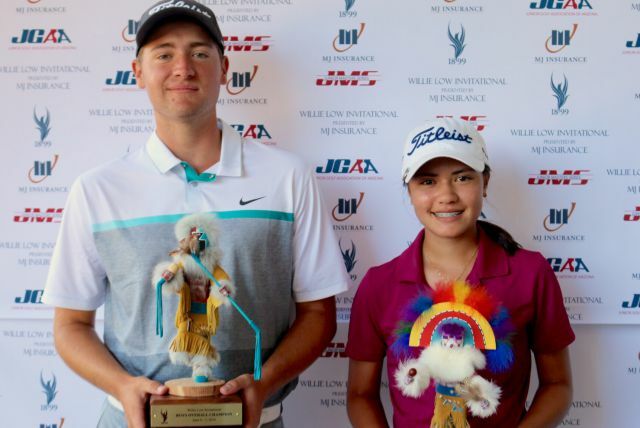 Ashley Menne of Surprise continues her outstanding play by posting her fifth consecutive win with a 69-69—138, 4-under-par performance at the Willie Low Invitational Presented by MJ Insurance, contested June 6-7 at Phoenix Country Club. This marks her seventh win in 12 tournaments played this season, finishing T3 or better in all but one. Four of her seven wins came at Junior Masters Series tournaments, the “Majors” of JGAA schedule. Mikayla Fitzpatrick finished in second place, while Megan Ohland fished third. Caden Weber of Peoria came in first place in the Boys Championship Division with a score of 72-67—139, 3-under par. He finished two strokes clear of second-place finisher, Tony Hendricks, of Phoenix and three ahead of Brock Goyen at third place. The win represents a breakthrough for Weber, who placed T14, T18 and T36 in the three events he’s played so far this season (all of which were Junior Masters Series tournaments). The event honors the late Willie Low, one of the Valley’s top golf professionals for nearly a half century who started the tournament in 1969. It has been showcasing the talents of junior golfers from across the state since then with past winners including PGA TOUR golfers Billy Mayfair (1983 and 1984), Ted Purdy (1989), Charlie Beljan (2000) and LPGA player, Sara Brown (2004). Low influenced many of the Valley’s top juniors, including Howard Twitty and a young George Boutell who would later go on to win the 1962 Arizona Amateur Championship and then post a stellar career at Arizona State University, earning All American status. The JGAA’s Junior Masters Series consists of seven regular tournaments and one Series Championship at some of the most prestigious courses in Arizona. Qualified junior players can sign up for the Junior Major Series by visiting www.JGAA.org. To learn more about the JGAA and the Junior Masters Series, contact Scott McNevin, JGAA Executive Director, smcnevin@jgaa.org, 602-944-6168.